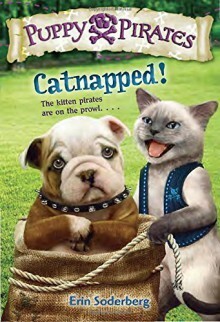 Hopelessly Devoted Bibliophile: Book Review: Puppy Pirates: Catnapped! Book Review: Puppy Pirates: Catnapped! Recommended to: Readers who love adventure on the high seas, with adorable puppies and kittens! Ahoy, mateys! Set sail for fun and adventure on a pirate ship full of puppies. Fighting like cats and dogs? Exactly! The puppy pirates played a prank on the kitten pirates, and meow! The kittens sure are mad. Can the pups escape the kittens’ claws? It’s dog vs. cat, and may the best pirates win. Two perennial kid favorites—dogs and pirates—combine in the new chapter book series perfect for fans of Rainbow Magic, Jake and the Neverland Pirates, and Paw Patrol. This book was adorable! I'm always on the lookout for transition books, those stories that bring young readers from picture books into the world of chapter books. When I was offered Puppy Pirates: Catnapped! for review, I eagerly snatched it up! Pirates, puppies and kittens? I'm honestly not sure there's anything more adorable to be added. While this book is the third in a series, it's not hard to pick it up and just start reading along. I was introduced to the crew of The Salty Bone, a pirate ship full of adorable puppies and one lucky little boy. Sailing the seas, having all manner of adventures, and getting into the type of mischief that will made young readers giggle with delight. I admit, I'm an adult and I was smiling. It's hard not to. The balance between illustrations and story are spot on, as are the length of the chapters themselves. I picture this as the perfect story to read before bed over a few evenings. It even has that sweet little lesson that comes along with most books aimed at this age group, and it isn't too heavy handed. Final verdict? Adorable! I'd recommend this to readers in transition who love adventure and excitement!